The Centre of Perinatal Excellence (COPE) is the Guideline developer for the New Australia’s Perinatal Clinical Practice Guidelines. The Guideline development has been informed and developed through the work of the Expert Working Group (EWG), formed through nomination of representatives from each of the Professional Bodies representing primary, maternity, postnatal and mental health care (as reflected in COPE’s Membership). Following extensive consultation with consumers, carers, professionals and governments, the Revised Guideline was approved by the NHMRC on October 17, 2017. The New Guideline was officially launched by the Federal Minister for Health, The Hon Greg Hunt on October 27, 2017. In partnership with Prevention Express and the Parent Infant Research Institute (PIRI), COPE has developed a new, digital platform iCOPE. iCOPE stands to revolutionise current screening practice in Australia through deploying the latest digital technology to make screening more efficient, effective and importantly, obtain valuable outcome data to inform service provision, policy and practice. The technology is also designed to guide practitioners in the detection and management of perinatal mental health conditions whilst for the first time providing consumers with tailored information in relation to their personal screening outcomes. For more information about iCOPE Screening and download our information brochure click here. To download the Executive Summary of iCOPE Screening Feasibility Trial click here. Funded by the Commonwealth Government, this detailed scoping study sought to determine the degree to which core components of Australia’s National Perinatal Depression Initiative (NPDI) are currently integrated across the 85 Aboriginal community controlled health organisations and primary health care settings that are funded by the Commonwealth to provide New Directions Mothers and Babies Services. Using extensive qualitative and qualitative methods, the project has obtained important insights into current awareness, attitudes and practices amongst health practitioners across these New Directions settings. 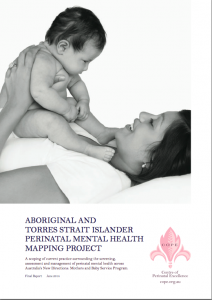 In particular, current practices surrounding screening, treatment and referral pathways has identified current opportunities and barriers to best practice in perinatal healthcare across Aboriginal and Torres Strait Islander populations nationally. To view or download the full report click here. Following extensive qualitative research revealed a range of issues for women who are experiencing depression and/or anxiety during pregnancy, this large scale study seeks to quantify the extent to which these findings are relevant to the broader population. Through undertaking an anonymous and confidential online survey with over 1000 women to date, the findings have revealed detailed insights into women’s experience of symptoms, stigma, help-seeking behaviour and experiences with treatment services. This information has been used to underpin the information that COPE provides to women, families and health professionals, informs our strategic directions, and enables us to undertake important research and identify areas of need for advocacy surrounding perinatal care. To take part in this important research and inform the work of COPE click here. In order to estimate the costs incurred by perinatal depression and anxiety associated with births in 2013, COPE in partnership with PricewaterhouseCoopers (PwC) are undertaking an economic analysis of costs incurred for not treating perinatal depression and anxiety. These findings reveal the potential scale and scope of perinatal depression and anxiety in Australia for one year. To download the report click here. The Perinatal Workplace Well-being workshop builds upon existing national workplace programs to provide a much needed perinatal focus. Developed by Transitioning Well (TW) in partnership with COPE, this 1.5 hour workshop is underpinned by the nationally endorsed Perinatal Clinical Practice Guidelines and facilitated by an accredited perinatal workplace psychologist. One in seven mums and one in ten dads suffer from postnatal depression. Even more people experience anxiety and many (around half) experience depression and anxiety at the same time. Compared to many other life stages, the transition to parenthood is a high-risk time to experience psychological distress or develop/have a reoccurrence of a mental health condition. Lost productivity due to perinatal depression is estimated to cost Australian workplaces $310.34M each year. Develop practical skills and strategies to manage perinatal mental health issues at work.